Come join the fun. Visitors are welcome to come and see what we have to offer. Our guild hosts speakers usually twice a year and we have a program each month. 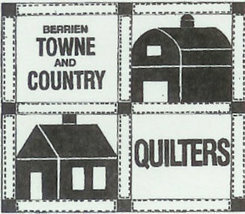 We host quilting retreats twice a year. ​​Meetings are held the second Thursday of the month, February through November. ​Social time starts at 6:30 p.m. Meetings begin at 7:00 p.m.
5506 Ridge Rd., Stevensville, MI 49127.